INFINITE has successfully experienced various successes aside from the group’s activities, starting with INFINITE H (Hoya & Dongwoo) to Sunggyu‘s solo debut, and also ToHeart which was formed by Woohyun and SHINee’s Key. 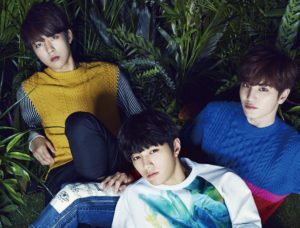 And finally on October 2014, Woolim Entertaiment announced that Infinite would form a new sub-unit called INFINITE F that consists of Sungyeol, L and Sungjong. They officially debuted in Japan with “Koi no Sign” on November 19th, 2014. 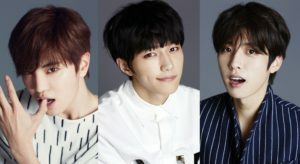 Inspirit (INFINITE fans) were already familiar with the sub-unit, as they previously sang the track Going Crazy in INFINITE’s ‘Season 2’ album. They also first performed as an unofficial unit at ‘INFINITE’s 1st Inspirit Inauguration’ on August 17th, 2011. The trio did a cover of Orange Caramel’s Bangkok City which was well received by fans. How Tall is TWICE Tzuyu’s Current Height? The sub-unit is known as INFINITE F (ace/flower) and it’s made up of the three youngest members from INFINITE (maknae lines). They made their official music show debut on Music Bank on December 5th, 2014. And INFINITE F became the first INFINITE sub-group or solo to be nominated for first place on a music show. – He has a brother who is 3 years younger than him, named Seonkyu. – He loves to perform girl group dances. In fact he was dancing them so much that WOOLIM’s CEO put a ban on them. – Sungjong is very photogenic. He thinks he is prettier than some girl group members. – He loves Michael Jackson’s songs “Beat It” and “Ben” the most. – His favorite food is : “What my mom cooks“. – His least favorite food is beans. – He was part of the cast of “Law of the Jungle in Tonga” (2016). – Sungjong listed his eyes as the body part he’s most confident with. – Sungjong was chosen as the MC for “Stargram Season 2”. – Sungjong’s ideal type: “Someone who is chubby and cute“. – When INFINITE first debuted there was a controversy about his gender. He said it didn’t bother him at all. – According to Sungyeol, whenever Sungjong is mad at another member he takes his fury out on his stuffed animals by punching and slapping them. – He grumbles a lot when the members pick on him and order him around. – He is said to be very optimistic. -One of the things he dislikes the most is WooHyun when he’s lying. – He says since his parts are short, he practices hard to leave a strong impression. – If given a solo performance he would like to do a trot song. – He first developed the dream of becoming a singer because he really liked the feeling of dancing at his school festivals. – WOOLIM’s CEO wanted to dye Sungjong’s hair blue for the “BTD” promotions. But the blonde came out so well that they kept it. – He wants to jump in the audience someday at an INFINITE solo concert. – He shared a room with Hoya. -When asked to choose between 4Minute’s Hyuna and f(x)’s Krystal, he chose Hyuna. 2011 Just Like That Show Tooniverse Himself The show’s name is ‘막이레쇼’ in Korean. – He has a younger brother named Moonsu. – He was an Ullzzang in Sungdonggu. – Myungsoo likes to take pictures and would’ve liked to become a photographer if he wasn’t a singer. – His hair is naturally curly and frizzy. – He eats the most out of the INFINITE members. – He is good friends with UKISS’s Eli. – He was in Epik High’s “Run” MV. – His favorite color is black and most of his clothes are black. – He thinks that out of all animals, he resembles a hippopotamus the most. 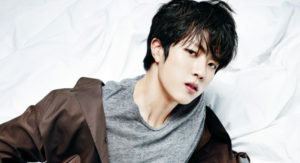 – He said he does not like Sungyeol, although they always do fanservice together. – His Japanese is the best in Infinite. – He was a voice actor for the cartoon “Welcome to the Convenience Store“. – He likes to read Naruto, Bleach and One Piece. – He says that a habit he needs to fix is his stubbornness. – His stage name is from the character “L” in the manga/anime “Death Note“. He sounds like him and he use to look like him in his trainee days because of his long hair. – Known as “The Ice King”. – He says that if you don’t know the answer to a multiple choice question, the answer is always the 3rd option (or C). – He began to want to be a singer after watching one of Craig David’s performances. – He sleep talks and thrashes around in his sleep and is said to wake even Dongwoo up. – He knows how to play guitar. He can also rap. – Interviewers sometime get frustrated with him because he is so quiet. – His role models are TVXQ/DBSK. – He made an apperance in “God of Study“, but his part got cut out. He has said that he is going to make the writers regret cutting him out. – He shared a room with Dongwoo and their manager. – When asked to choose between 4Minute’s Hyuna and f(x)’s Krystal, he chose Krystal. – L / Myungsoo’s ideal type : Someone with long wavy,hair and an innocent charm. – He has a younger brother named Daeyeol, who is a member of Golden Child, under the same company. – Sungyeol is the last member who joined Infinite. He originally planned to debut as an actor. – He is competitive in games. – He has dyslexia, which runs in his family as his brother, Daeyeol, has it too. – Sungyeol’s favorite food is Ton Katsu. – His least favorite food is bean paste soup. – His favorite colors are pink, purple and green. – One of his hobbies is watching movies. – The perfume Sungyeol currently uses is Voyage d’Hermès by Hermès. – He always carries cologne in his bag. – He was part of the cast of “Law of the Jungle in Caribbean/Maya Jungle” (2013). – He was part of the cast of “Law of the Jungle in Panama (2016)”. – He was part of the cast of “Law of the Jungle in Kota Manado (2017)”. – Sungyeol has family members in the entertainment industry, but he doesn’t want to rely on their help so that he can see how far he can go by himself. – One of his most prized possessions is a letter from a fan that he keeps in his desk. – He used to be in the acting part of SM Academy. – He would like to try to act as a character that is strong yet funny like Yoo Hae Jin or Kim Chang Jung. – He’s afraid of ghosts. – He is currently learning English. – An actress that he likes is Soo Ae. This album was released in a regular edition and two limited editions, all with three tracks. Besides the title single, the release also includes “Kimi ga Sukida yo” and the Japanese version of “My Girl“ as B-side tracks. Akiko Higashimura, creator of Princess Jellyfish, provided illustrations for the album jacket. “Koi no Sign” debuted on the Oricon Weekly Chart at #6 and selling 31,287 copies. 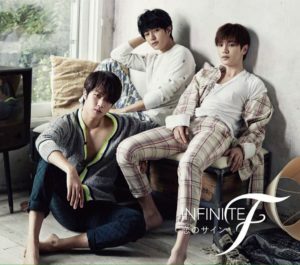 The sub-group was actually meant to focus their promotions on the Japanese market, but Woolim Entertaiment decided to start promotional activities for INFINITE F on music shows in South Korea with “Heartbeat” and released the MV on December 1st, 2014. In the music video, the three boys are seen preparing sweet gifts for their other half, acting out how a person’s heart beats nervously when they’re in love. With excitement, they take off in a hot air balloon, as if taking off to a brand new beginning. The song and the music video is sure to melt fans’ hearts and guard them against the frigid winter season, check out their music video below!